View More In Parallel Cables - Page 4. 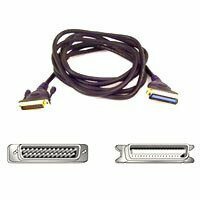 This Pro Series Parallel Printer Cable links your IEEE 1284 printer with a Centronics 36-port to your PC with a DB25 port. It features Belkin's exclusive wiring design and cable technology that guarantees optimal performance and data transfer. This cable features 24K gold-plated corrosion-proof connectors for maximum conductivity. The Tactilite molded strain relief provides a 360-degree turning radius for true protection against damage to the conductors, and the Flextec cable jacket is very durable and extremely flexible for use in tight areas.